Studbook Palomino Register: mares & stallions - must have 2 registered parents. Proof must be provided. Must PASS classification on colour and conformation. Non-studbook Palomino Register: mares & stallions - either one or both parents are unknown / unregistered / unproveable. Must PASS classification on colour and conformation. These palominos have full showing rights. Gelding Register: geldings - may have either registered or unknown / unregistered / unproveable parentage. Must PASS classification on colour and conformation. 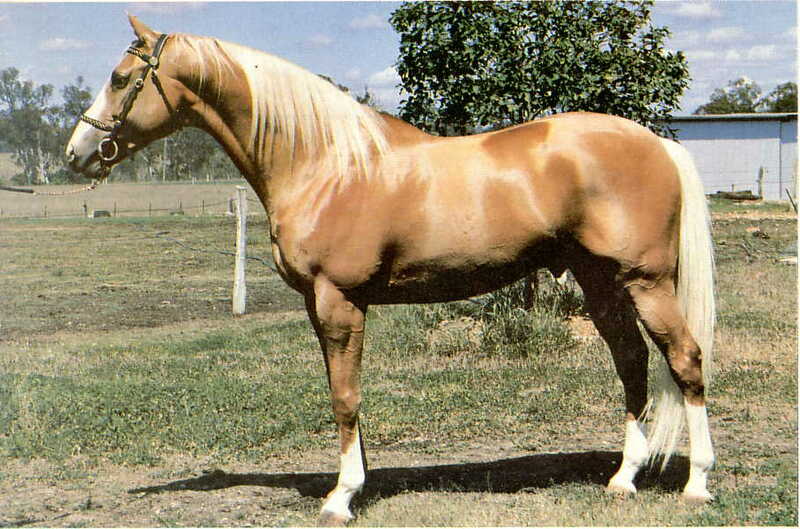 NB: It is important to understand that the colour standard of excellence represents the 'ideal' that palomino breeders should be striving for and that just because a palomino has some colour faults (ie dapples, smutting or ticking) it doesn't automatically follow that s/he is not eligible for registration. The reality is that very few palominos do conform across all criteria so if owners are unsure about whether or not their horse or pony will qualify for registration they should submit photos to the registrar for clarification. Must be a red based horse or pony carrying one copy of the cream dilution modifier and no other dilution modifier. Horses and ponies carrying any other dilution modifier will be registered under that dilution. Have a body coat the colour of a newly minted gold coin or three shades lighter or darker, or of a colour range prescribed by the Board. Have a mane and tail of white, silver or ivory, with not more than 15% dark or chestnut hair in either the mane or the tail. Not have spots or patches of black, brown or chestnut exceeding in total 25 sq cm. Have a body free from imperfections and free of white spots except those caused by accident. Be permitted white markings on the face and legs only, the legs not to be white above the knees or hocks save for a continuous diminishing spear or stripe running above the knee or hock. NO palomino may have ANY white markings (ie belly splashes) other than those permitted under the Regulations of the Company. Notwithstanding this, an owner may apply to have a horse or pony accepted for registration under the company's hardship clause which allows for small amounts of underbelly white. Have a basic skin colour which is dark. Have both eyes dark and the same colour. Wall eyes are not acceptable. Not exhibit any appaloosa characteristics. Solid horses and ponies with appaloosa/palouse/spotted pony parentage must be DNA'd for Lp and must return a negative result to be eligible for registration. NB - when classifying no marks in credit are given for iridescence, this is only a credit in the show ring. Visit the Palomino Colour Faults page for photos of specific colour faults.